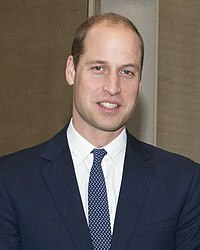 English: HRH Prince William, Duke of Cambridge (William Arthur Philip Louis; born 21 June 1982) is the elder son of Charles, Prince of Wales and the late Diana, Princess of Wales. Second in the line of succession to the British throne, and grandson of Queen Elizabeth II, Prince William is a member of the British Royal Family. Media in category "Prince William, Duke of Cambridge"
This page was last edited on 28 December 2018, at 05:36.